The brains belonging to these killers shared a rare and alarming pattern of low brain function in certain parts of the frontal and temporal lobes—areas commonly associ­ated with self-control and empathy. This makes sense for those with a history of inhuman violence, since the reduction of activity in these regions suggests a lack of a normal sense of moral reason­ing and of the ability to inhibit their impulses. However, having had his own brain scanned for a separate project on Alzheimer's Disease, he discovers that one of the scans of his own family (who were serving as the control group) has a pattern nearly identical to the psychopaths . . . and it was his scan. One October day in 2005, as the last vestiges of an Indian summer moved across Southern California, I was inputting some last-minute changes into a paper I was planning to submit to the Ohio State Journal of Criminal Law. I had titled it “Neu­roanatomical Background to Understanding the Brain of a Young Psychopath” and based it on a long series of analyses I had performed, on and off for a decade, of individual brain scans of psychopathic murderers. These are some of the baddest dudes you can imagine—they’d done some heinous things over the years, things that would make you cringe if I didn’t have to ad­here to confidentiality agreements and could tell you about them. But their pasts weren’t the only things that separated them from the rest of us. As a neuroscientist well into the fourth decade of my career, I’d looked at a lot of brain scans over the years, and these had been different. The brains belonging to these killers shared a rare and alarming pattern of low brain function in certain parts of the frontal and temporal lobes—areas commonly associ­ated with self-control and empathy. This makes sense for those with a history of inhuman violence, since the reduction of activity in these regions suggests a lack of a normal sense of moral reason­ing and of the ability to inhibit their impulses. I explained this pattern in my paper, submitted it for publication, and turned my attention to the next project. At the same time I’d been studying the murderers’ scans, my lab had been conducting a separate study exploring which genes, if any, are linked to Alzheimer’s disease. As part of our research, my colleagues and I had run genetic tests and taken brain scans of several Alzheimer’s patients as well as several members of my fam­ily, who were serving as the normal, control group. 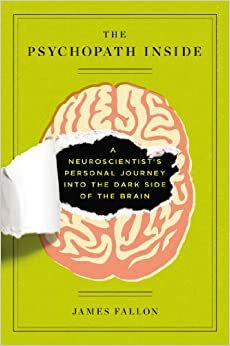 Reprinted from The Pyschopath Inside: A Neuroscientist’s Personal Journey into the Dark Side of the Brain, by James Fallon with permission of Current, a member of Penguin Group (USA) LLC, A Penguin Random House Company. Copyright (c) James Fallon, 2013. James H. Fallon, Ph.D., is professor of psychiatry and human behavior and emeritus professor of anatomy and neurobiology in the School of Medicine at the University of California, Irvine. His research interests include adult stem cells, chemical neuroanatomy and circuitry, higher brain functions, and brain imaging. He has served as Chairman of the University faculty and Chair and President of the School of Medicine faculty. He is a Sloan Scholar, Senior Fulbright Fellow, National Institutes of Health Career Awardee, and recipient of a range of honorary degrees and awards, and he sits on several corporate boards and national think tanks for science, biotechnology, the arts, and the U.S. military. He is a Subject Matter Expert in the field of "cognition and war" to the Pentagon's Joint Command. In addition to his neuroscience research, James Fallon has lectured and written on topics ranging from art and the brain, architecture and the brain, law and the brain, consciousness, creativity, the brain of the psychopathic murderer, and the Vietnam War. He has appeared on numerous documentaries, radio, and TV shows. What makes someone a psychopath? Can these traits be passed through family lines? Neuroscientist James Fallon, and author of The Psychopath Inside: A Neuroscientist’s Personal Journey Into the Dark Side of the Brain, discusses his scientific and personal exploration into the antisocial mind. Publisher's Weekly: "The Psychopath Inside—A Neuroscientist’s Personal Journey into the Dark Side of the Brain"
The Wall Street Journal: "What's on Jim Fallon's Mind? A Family Secret That Has Been Murder to Figure Out"
TED: "James Fallon—Exploring the Mind of a Killer"